Saturday, February 16th ~ 12:00 p.m.
Join in on the fun as the Sault Ste. 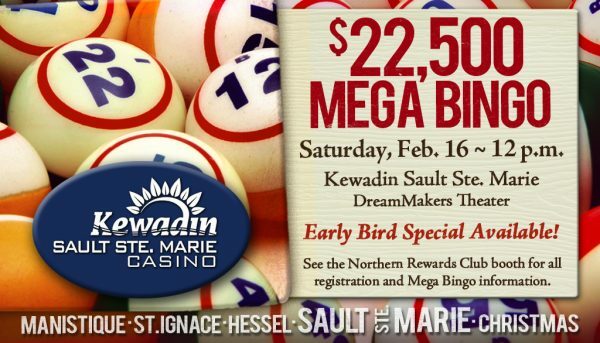 Marie Kewadin Casinos hold their $22,500 Mega Bingo event. Kewadin Sault Ste. Marie offers a special package of an entry into the Mega Bingo for $75 and a discounted room rate of $55 for those that participate. Rooms will be based on availability. There will be postcards mailed out to those that have previously played in our Mega Bingos for a chance at $200 in free play if you bingo on your bonus number given in the mail. There are also bonus offers for those that sign up before the date of the event!! Pre-registration is $75 and $90 on the day of the event. If you would like to sign up or for more details, please contact Ron Neal at 1.800.539.2346 ext 54958.